Meetings professionals from corporates including AstraZeneca, Novartis, Pfizer and Takeda Europe took part in the inaugural Zibrant Healthcare Meetings Forum. 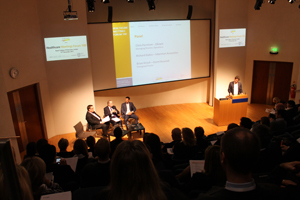 The event, which attracted nearly 100 pharmaceutical representatives from across Europe, was held at the Royal College of Physicians in London on 15 November and was organised by event agency Zibrant. Presentations examined the challenges faced by the healthcare meetings sector from an international and UK perspective, as well as how technology can be used in areas such as crisis management. Panellists included representatives from Zibrant, pharmaceutical groups AstraZeneca, Novartis, Pfizer and Takeda Europe, technology firms Arcaneo Metron and StarCite, hotel company Melia Hotels International and insurance specialist Event Assured. Hannah Wilkinson, Zibrant’s global director of business development healthcare, said: "The healthcare meetings sector has hitherto been quite insular but there now seems to be an appetite to share best practice, particularly in areas such as meetings policy, strategic meetings management and globalisation. "We will definitely be repeating the event next year - dates will be announced shortly." Joanna Lawlor, AstraZeneca UK’s meetings lead and head of events, added: "I really felt that the Healthcare Forum was an excellent idea. "Whilst we all work as partners to deliver meetings, how often is it that the client, agency and supplier get the opportunity to sit in a room together and discuss those issues that affect us on a day to day basis? "The whole day was professionally run, with an excellent representation from all key areas of the events world. On its premiere, it’s established itself as a must in the pharmaceutical industry diary."